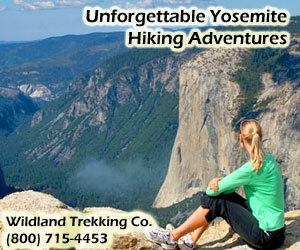 The Half Dome hike is steep, challenging and rewarding. Spectacular views include Vernal and Nevada Falls, Half Dome and Liberty Cap, culminating in a panoramic vista of Yosemite Valley and High Sierra. The last 900 feet is a very steep climb up the east side, assisted in the final 400 feet by two steel cables. The cables, which are three feet apart and attached to pipes embedded in the rock, are generally up from late May through early October. Happy Isles, shuttle stop #16, is a half-mile from the trailhead parking lot. Shuttle service from the parking lot to the trailhead begins at 7 am. A permit is required. Bring water and wear proper footwear. Dress in layers, watch for bears. Don't hike if the cables are down, in lightning or inclement weather.